On a cold windy day, it’s time to do some science. 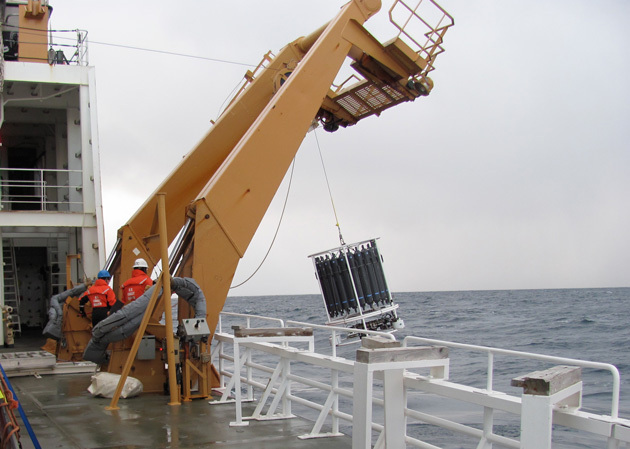 Yesterday we reached our first work station in the northern Chukchi Sea off Cape Barrow, Alaska. For the first time it really felt like what I imagined the Arctic Ocean would be: cold, windy, slate gray. Most of yesterday’s work involved launching and retrieving the CTD off the ship with the help of a deck winch (photo above), and sending it down as far as 2,625 feet (800 meters) deep. 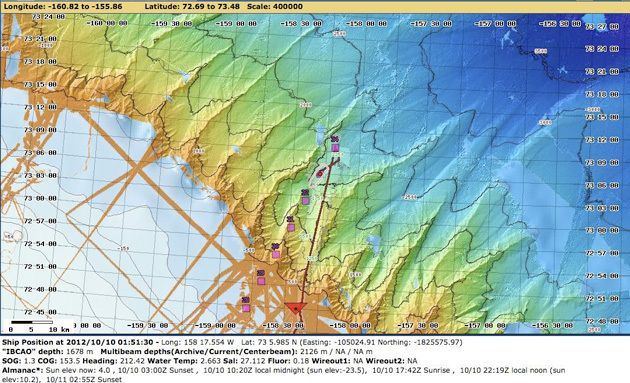 This was done over and over again as we began to work the hydrographic stations running in a V-shaped line across roughly 210 miles (339 km)—from the outer edge of the Alaskan shelf, veering west across the Harriet Bank, then back east towards shallow water near shore. There are 20 CTD stations on this line, between 3 and 6 miles (5-10 kilometers) apart. So what is a CTD? It stands for conductivity-temperature-depth profiler, a throwback to early oceanography when those properties were all that were being measured. Nowadays it measures a whole lot more. 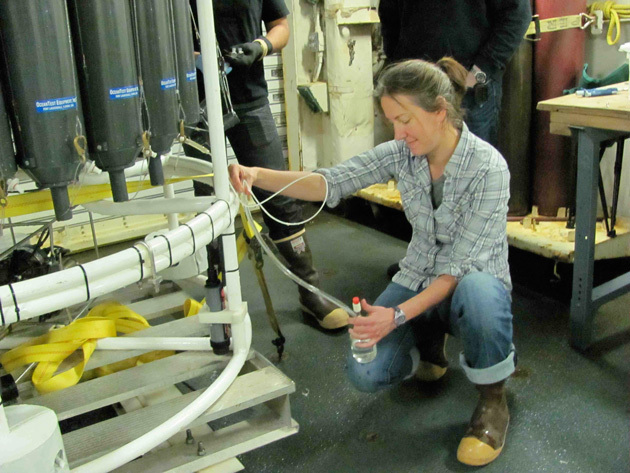 But basically it’s a bundle of instruments and water bottles that is sent to the bottom (or some predetermined depth shy of the bottom) on a cable, which collects data on the way up and down and collects water samples on the way up. The whole contraption is called a package and is composed of several parts. Part one is the sensors, located in the bottom of the package, which measure various parameters of sea water: temperature, oxygen, salinity, depth, pressure, chlorophyll, particles, and light penetration. 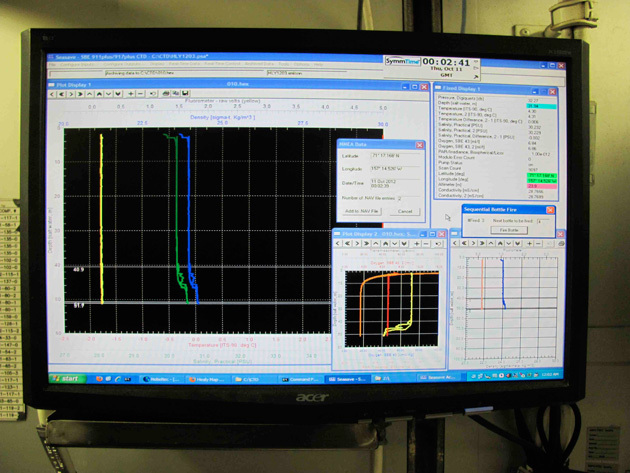 Data from these sensors are continually fed up to the ship’s computer network through a coaxial cable. Which means I can sit in my cabin and watch the data rolling in on my laptop. Pretty cool. Part two of the package are the gray tubes known as Niskin bottles, arranged in a ring, or rosette. There are 24 bottles on this rosette, each capable of capturing 5.28 gallons (20 liters) of water. The bottles descend empty and are individually fired to open at predetermined depths on the way up. So the first bottle will capture water at the bottom of the cast and the last one will capture at the surface. In general, fewer Niskin bottles are fired in the deeper parts of the cast, since deep water tends to be more stable. As the package nears the surface Niskins are fired more frequently, since the shallow water is where so much of the action is happening. What is the action? Well, it’s the processes that affect the surface layers of the ocean far more than the depths. Some of these processes come from the land, like river flows and coastal erosion (which introduce different chemistry into the water). Some come from above, like rain and sunlight. Some come from the primary producers, the phytoplankton (the tiny drifting plants of the sea that convert light into energy and make the life that feeds everything else). Some come from the animal life of the ocean, beginning with zooplankton (the tiny drifting animals of the sea, many of them the larval forms of bigger life like fish), and all the way through the food web from sea stars to whales. Each of these processes affects the chemistry of seawater. And the chemistry of seawater determines which way the waters flow–that is, the direction, strength, and depth of oceanic currents. Which in turn affect our climate. I’ll write more on that later. So the chemistry that Jeremy Mathis’ group and others aboard are investigating from each Niskin bottle are the following: methane, oxygen, oxygen/argon isotopes, pH (the relative acidity or alkalinity of the water), carbonate, dissolved organic and inorganic carbon, stable oxygen isotopes, nutrients (think fertilizers), chlorophyll, including HPLC (high-pressure liquid chromatography) that indicates which types of phytoplankton are present, salts, and particles (often from sediments on the bottom). The scientists collect many individuals “sips” of water from each Niskin bottle, siphoning off one sip for each of the properties listed in the paragraph above. Each sample goes into a separate bottle. Some samples are immediately analyzed in a lab aboard Healy (more on that later). Others will be analyzed ashore. The action is fast and furious. 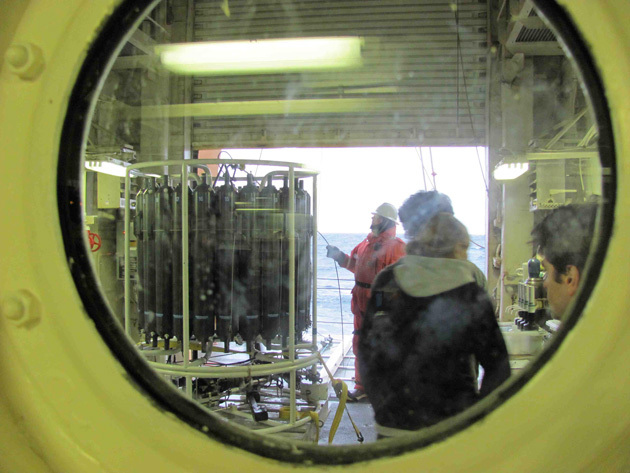 As soon as all the samples from the CTD have been collected it’s prepped to go back down again. 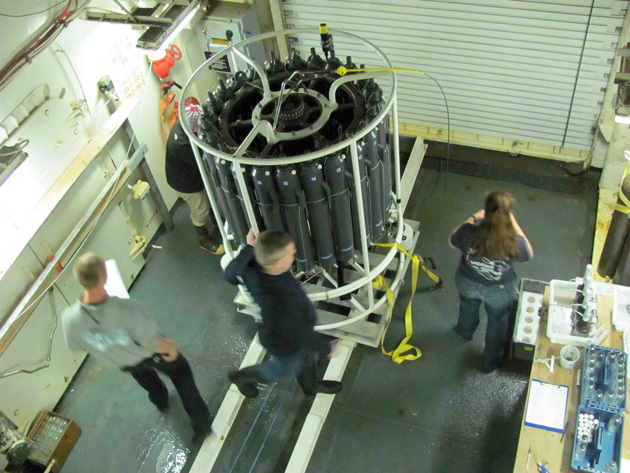 The time between launching the CTD, sending it to the bottom, bringing it back up, recovering all its samples, and then prepping it to go down again–where the stations are only 3 miles (5 kilometers) apart–is about one hour. Together, these data will begin to paint a picture of the flow of water off Alaska known as the West Arctic Boundary Current. 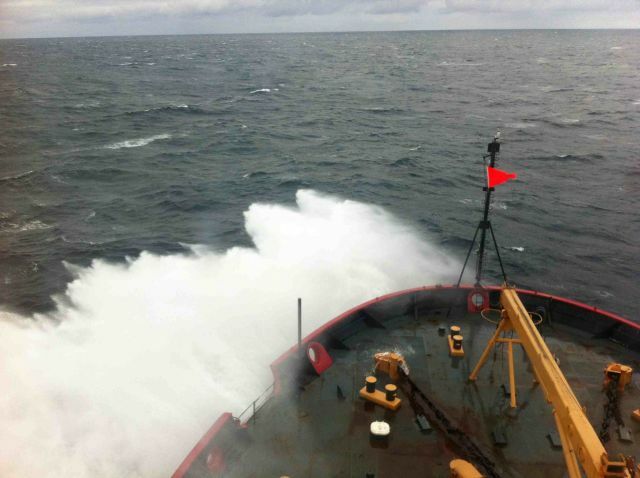 Courtesy of Master Chief Tim Sullivan, USCG. 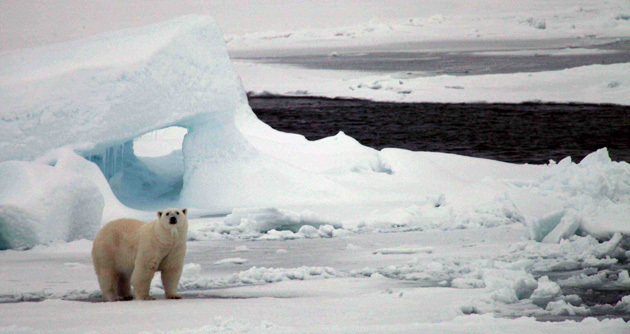 And ultimately, from Jeremy’s lab, a picture of how a warming climate is affecting the pH of the Arctic Ocean, as processes that were once frozen and more stable thaw and become enormously dynamic. Jeremy Mathis’ research aboard Healy this cruise is supported by the National Science Foundation, Office of Polar Programs.